If you're going to write about how self-involved Millennials are, you'd better be prepared for that generation to complain about you on all forms of social media. Or you might have asked for the piece to be written because you're a totally brilliant editor who enjoys traffic trolling. 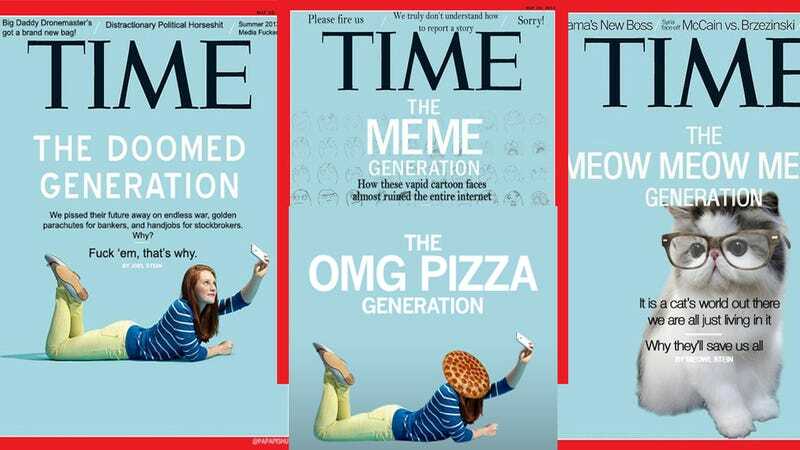 At least, that's what many people pointed out Thursday – fittingly on Twitter – after the release of Joel Stein's Time magazine article about the growing narcissism of Millennials. "The incidence of narcissistic personality disorder is nearly three times as high for people in their 20s as for the generation that's now 65 or older, according to the National Institutes of Health; 58 percent more college students scored higher on a narcissism scale in 2009 than in 1982." At the Atlantic Wire, Elspeth Reeve rejected Stein's claims based off of other data (there's always other data), but also outlined about "a century or so of culture writers declaring the youth to be self-obsessed little monsters", through articles published by her own publication, as well as New York magazine, The New York Times, Newsweek, etc. Over at the Daily Intel, Joe Coscarelli compared the piece to Tom Wolfe's "The Me Decade" from 1976. And there's also a video featuring Stein (which is not behind a paywall like the main piece is) of which Logan Sachon at The Billfold wrote, "Oh, but this video. I just can’t with this video." "Dependence, interiority, and the careful construction of fantasy lives aren’t solely the provenance of girls and women of course, but they’re traits that are coded as feminine. And technology and economics have made those traits much more visible when men and women display them."